The bouquet and tastes of different wines are very complex but wine itself starts out as a simple blend of grapes and yeast that are left to ferment naturally. During fermentation the grapes' natural sugars are transformed into alcohol with carbon dioxide given given off as a byproduct. The final delicate balance between each wine's carboyhydrates, amino acids, phenols and other elements is what gives rise to the underlying flavours and bouquet that characterize each individual wine. This is largely dependent on natural factors, including the type of grape selected, the ground it was grown in (terroir) and the weather conditions present while the grape was growing and ripening. But the subtle variations between wines are also due in part to the conditions in which the wine was produced – elements such as the amount of yeast added, ambient temperature during fermentation, humidity, length of fermentation and other factors, all of which will affect the wine's ultimate distinguishing characteristics. For hundreds of years, wine was left to mature in dark, damp and chilly cellars and nobody really understood quite what occurred over time to the wine inside the bottle, or exactly why some wines emerged enriched while others failed to improve and or even lost their character after being laid down. Thanks to modern technology, we now understand more about the way ambient processes affect wines' aging processes. It is now generally accepted that the best temperature for long term wine storage is 12-14°C (54-57 °F). However, this temperature can also be increased or lowered to speed up or slow down the rate at which your wine matures, depending on when you plan to open the bottle. For example, if you plan to drink your wine after only 1-2 years you can accelerate the development of each bottle's bouquet by increasing the ambient temperature to 15-18 °C (60-65°F). An ambient temperature of 18°C (65°F) will double the speed at which the chemical reactions within the bottle take place, hence the bouquet will develop effectively but in less time. However, if you increase the ambient temperature too much – beyond 21°C (70°F) – the rapid increase in chemical reactions will result in unbalanced aging processes and will adversely affect both the flavor and bouquet of your wine. Similarly, fluctuating storage temperatures (even relatively minor fluctuations of just 2-5°C (5 to 10°F) will have a negative impact on your wine. Conversely, if you plan to store your wine for longer periods of time then it is better to lower the temperature a few degrees to slow down the maturing process of the wine in the bottle. Generally speaking, the best white wines usually reach their optimum maturity faster than red wines but benefit by a longer and slower maturing process – hence they benefit from cooler temperatures. If they mature too quickly in warmer storage conditions the result is a loss of their fruity characteristics (esters). Thanks to modern technology, we now understand more about the way ambient processes affect wines' aging processes. The corks that are used to seal wine bottles are made out of the bark of cork oak trees. A natural material, cork will generally last up to 10 years before it starts to deteriorate. However, over-warm or too-humid environments will speed up the deterioration process and make your corks more vulnerable to mould which can also disfigure your bottle labels. Conversely, ambient environments that are too dry will cause your corks to dry out, shrink and even crumble, allowing air to enter the bottle and affecting the quality of your wine. Corks that become too loose will no longer seal effectively, affecting the pressure inside the bottle, permitting wine to leak out and even exposing it to air. Corks can be replaced where necessary and this should not affect the ultimate enjoyment of your wine provided that the new cork is inserted before the wine has had a chance to spoil. The reason we store good wine on its side is to keep the cork wet at all times. This ensures that the amount of air passing through the cork and into the wine is kept to the minimum. If too much oxygen gets into the wine this will change the chemical reactions that take place as the wine matures and cause you wine to spoil – which is one good reason not to store your bottles in a vertical position. It is also best not to move your wine around too much during the maturation process. Vibration and movement of any sort can negatively impact the complex molecular structure of your wine which is what gives it its characteristic depth. At Rosehill we build wine cellars that are designed to give your wine a consistent environment throughout the aging process. We ensure that your wine is stored at an ideal temperature, optimum humidity, and free of vibrations. California redwood is often used for the racking system because it responds well to the cool, moist environment of a wine cellar. Wood/stain with odor, off gassing or any other smalls in your cellar may be absorbed into the bottle as it matures in the cellar. 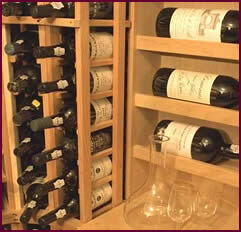 Proper wine storage provided by Rosehill Wine Cellars will ensure you enjoy your wines to the fullest. A constant temperature of 50-57 °F is considered ideal for wine to reach its peak. Maintaining the appropriate temperature while avoiding drastic fluctuations is the most essential factor to optimizing proper wine storage. The humidity levels should ideally be between 50-70%, no higher, no lower. Humidity levels assist corks to retain their sealing ability. 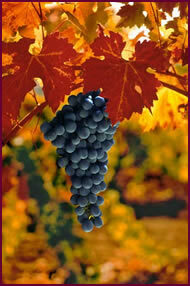 Ultra-violet light can cause oxidization of the tannins. Vibration disturbs the slow process of biochemical evolution in wine and is often fatal to finer crus. It is best to keep wine in one spot as opposed to continuously moving it around. This allows elimination of odor build-up or mold. Young, soft, light reds are put to their advantage when served chilled at around 12°C. Other reds should be served between 15°C and 18°C depending on their age and robustness. Champagnes should be served between 8°C and 10°C. If you would like more information about the best ways to store and enjoy your wine please don't hesitate to contact us. Visit our Toronto retail location and showroom, open from Monday- Friday from 9am-6pm and Saturdays from 10am-5pm.